It’s Restaurant Week again in NYC. This bi-annual event allows you to get 3 courses for $38 from a large list of restaurants. Granted, by the time you add up for the wine and tip and all its not that much cheaper than just going out to dinner but it’s a fun excuse to go out and allows you to go to restaurants you usually wouldn’t have chosen. To pick your restaurant and see the menus you can go to www.nycgo.com. My work friends and I have made it our tradition to always take advantage and this year is no different. How is it already March?! This bucket list is starting to look daunting. Restaurant week takes care of one item on my list but we had some time and I wanted to cross off one more on our way to the restaurant. My friend Renee told me about a hidden subway platform off of the 6 line near the Brooklyn Bridge stop about a year or so ago but I’ve never made the time. This was the perfect time to do it since we were taking the 6 train to get to the restaurant. 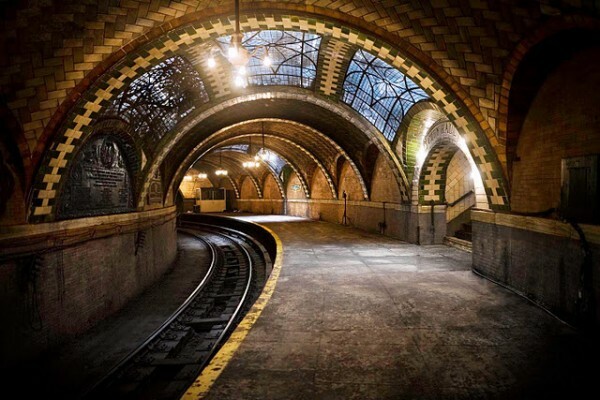 The beautiful old station was closed in the 1940s and you can see it if you stay on the 6 train after the last stop. It’s these kinds of little hidden treasures that make me love New York. So we get on the train after everyone has gotten off at the last stop. We’re a little nervous because we’ve heard that people have been given tickets but it was rush hour and the train conductor seemed to care more about the schedule than anything else. Honestly, you can’t see that much. You see the old sign saying City Hall and you see some of the old tiles but it’s too dark and the subways windows are a little awkward to see the real charm of the station. It’s still pretty cool and worth the easy trip on the 6 train. 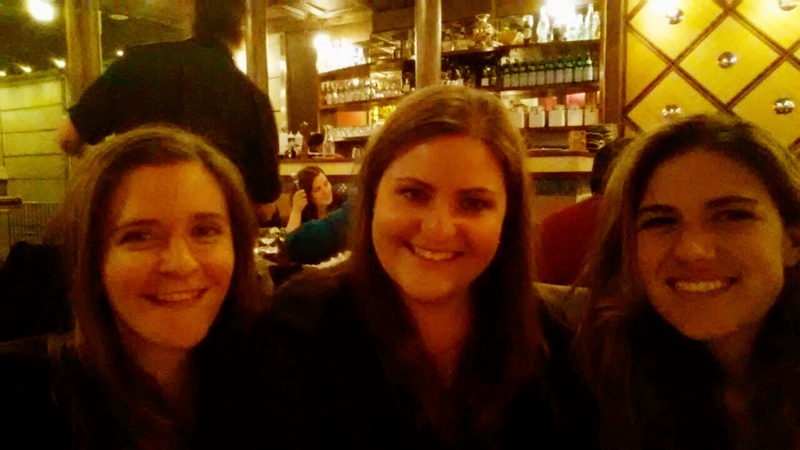 The restaurant we chose is a place in Little Italy, Grotto Azzurra. I usually stay away from Little Italy because it’s a tourist trap with prices to prove it but we made our way over to Broome Street and hoped that the winter would help with the crowds and the prix fixe menu would help with the prices. This place is as old school as it is adorable. We were seated under the mural of the statue of David as the huge platter of garlic bread passed us, and then the cute waiter came over and gave us the special menu. We ordered our food and it was exactly what we wanted, classic delicious Italian. The portions weren’t overwhelming, the flavor was perfect and the wine was well priced. I had chicken with fontina and asparagus but the winner of the night was Renee’s lobster ravioli. 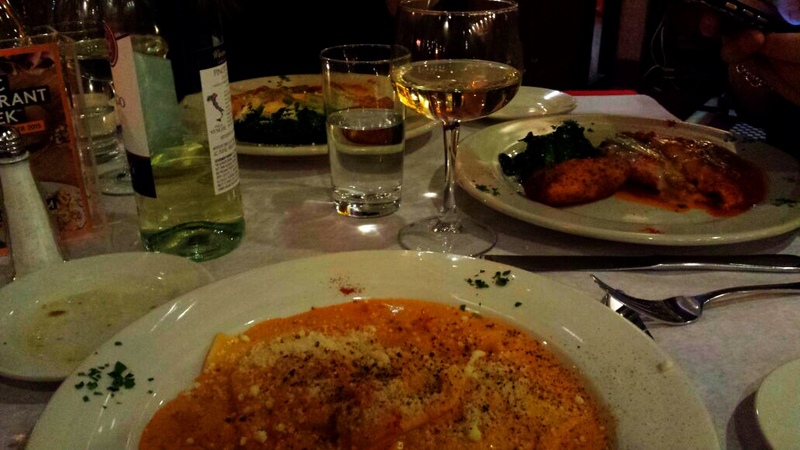 It was in a tomato cream sauce and was the best ravioli dish I ever had. Just thinking about it makes me sad that it’s not in front of my face now. Before we left they told us about their Thursday ladies night deal. They have half priced drinks and two free appetizers. We haven’t been there yet, but you can guarantee that they will see us again.